An important opportunity in graduate school is to get peer and mentor feedback on results. One of the best ways to do that is to share what you have been working on with your colleagues at a symposium. Come hear the latest updates from Johns Hopkins Institute for NanoBioTechnology’s research centers on Friday, November 7 from 9 a.m. to 12:30 p.m. in the Great Hall at Levering on the Homewood campus! Students affiliated with laboratories from the Johns Hopkins Physical Sciences-Oncology Center, Johns Hopkins Center of Cancer Nanotechnology Excellence and INBT will present at this student-organized symposium. This event is free and open to the Johns Hopkins community. Refreshments provided. 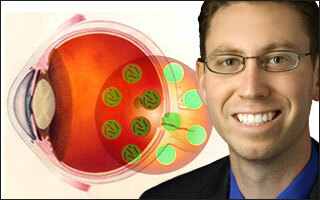 The keynote faculty speaker is Jordan Green, associate professor at Johns Hopkins Department of Biomedical Engineering. Green was recently named one of Popular Science magazine’s “Brilliant 10.” Breakfast, networking and introductions begin at 9 a.m.
**Kristen Kozielski – Bioreducible nanoparticles for efficient and environmentally triggered siRNA delivery to primary human glioblastoma cells. Jordan Green Lab. 9:30-9:45 a.m.
**Angela Jimenez – Spatio-temporal characterization of tumor growth and invasion in three-dimensions (3D). Denis Wirtz Lab. 9:50-10:05 a.m.
**Amanda Levy – Development of an in vitro system for the study of neuroinflammation. Peter Searson Lab. 10:10- 10:25 a.m.
**Max Bogorad – An engineered microvessel platform for quantitative imaging of drug permeability and absorption. Peter Searson Lab. 10:30-10:45 a.m.
**Greg Wiedman – Peptide Mediated Methods of Nanoparticle Drug Delivery. Kalina Hristova Lab. 10:50 to 11:05 a.m.
**Jordan Green – Particle-based micro and nanotechnology to treat cancer 11:10 a.m. – 12:10 p.m. Please RSVP on our Facebook event page here.